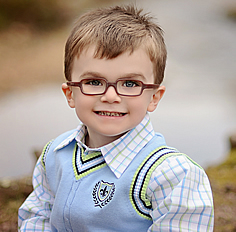 Meet Brayden – Retinoblastoma "Warrior"
Brayden was diagnosed with bilateral Retinoblastoma at just two weeks old. In order to give him the best chance of saving his life, his eyes and as much of his vision as possible, the doctors informed his parents that he would need treatment at Wills Eye and the Children's Hospital of Philadelphia. They were stunned at the news and unsure of how were they going to manage the 12 hour drive or four hour plane ride to Philadelphia for treatment every few months from their home in Greenville, SC. After enduring nine rounds of chemotherapy, a radioactive plaque, port and broviac placements, multiple hospital admissions and two recurrences, this brave little boy is now a social, active, four-year old preschooler. The NCCS has helped the Bateman's travel to Philadelphia over 25 times and they still make the journey north every six months for follow-up care. "We are so grateful for all of the support the NCCS has provided our family," said Sabra, Brayden's mom. "Their help has allowed him to get the best possible care for his rare cancer even though it's far away from home. Thank you NCCS!!"